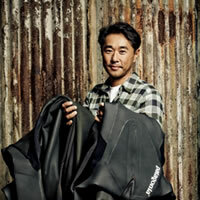 Tetsuya O'Hara is the program founder of the Environmental Entrepreneurship Development and a member of the board of visitors at Pepperdine University Graziadio School of Business and Management. He is also the Director of Advanced Research and Development for Patagonia, Inc., where he manages the advanced product design; new business concepts and new technologies for the products. Mr. O'Hara began his career at Teijin Limited, a multinational chemical company in Osaka, Japan, where he was in charge of sailcloth from 1985 until 1995, and contributed to the America's Cup as an official sailcloth supplier. In 1996, he moved his family to Connecticut to work for Dimension Polyant Sailcloth, Inc., where he developed new materials, including polyester-laminated fabric for NASA's environmental research balloon. The United States Patent Office approved his scientific inventions and granted him patents in January 2000, July 2008, June 2010, and August 2011. He has a bachelor's degree in economics from Doshisha University in Kyoto, Japan and a MBA from Pepperdine University. He also completed the Executive Education Program at Harvard Business School, Stanford Graduate School of Business, and Massachusetts Institute of Technology.